Facial hair restoration is using scalp or facial hair for restoring facial hair such as your mustache, beard and eyebrows. 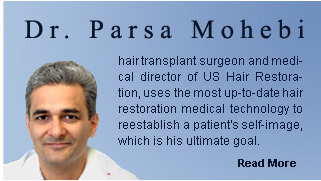 Parsa Mohebi Hair Restoration offices in Los Angeles offer a variety of facial hair transplant procedures for genetic or non genetic lack of hair on face. Facial hair transplant is designed to restore or add fullness to existing hair to the beard and mustache region. Hair loss or absence of hair in this area can be caused by many factors including genetics, trauma due by surgery, electrolysis or laser hair removal, burns or other scarring accidents. Donor hair is harvested from the scalp if it is identical in texture and growth to the beard and mustache. Hair could also be removed from the other areas if need be due to the difference in quality of the hair on those areas. The transplanted hair is permanent and needs to be shaved, trimmed or maintained like the rest of your hair. We carefully and artistically place your new hair grafts in the exact angle as the rest of your facial hair to assure a natural, undetectable look. All our procedures are done using exclusive follicular unit transplantation and microscopically dissected for the smallest incisions. Removing hair from the back is done with two different techniques: strip or FUE. We offer FUE transplant procedure through the use of follicular unit extraction (FUE) which is the most minimally invasive hair transplant procedure as well as the fastest healing procedure available. This procedure is conducted only after a FOX test is conducted and passed to determine your candidacy for FOX procedure.